Affiliate Arab Summit 2018: Learn, Connect, and Blast Off! Countries in the Middle East and North Africa (MENA) area are preparing for one of the most interesting events in the world of online marketing: the Arab Affiliate Summit 2018. And, as one of the leaders in the industry, we’re sending out a team of PropellerAds representatives to attend the event – which promises to gather the most influential stakeholders of the affiliate marketing industry in one venue. Here’s what you need to know to get the most out of the AAS 2018. This year, the Arab Affiliate Summit comes back for its fifth edition. The event will be hosted outside of Egypt for the first time, setting up shop in Casablanca, a vibrant business city in Morocco. The AAS is a three-day event that runs through November 1st through the 3rd. While it focuses on the MENA region, the event brings in more than 1000 local and global affiliates together under the same roof. 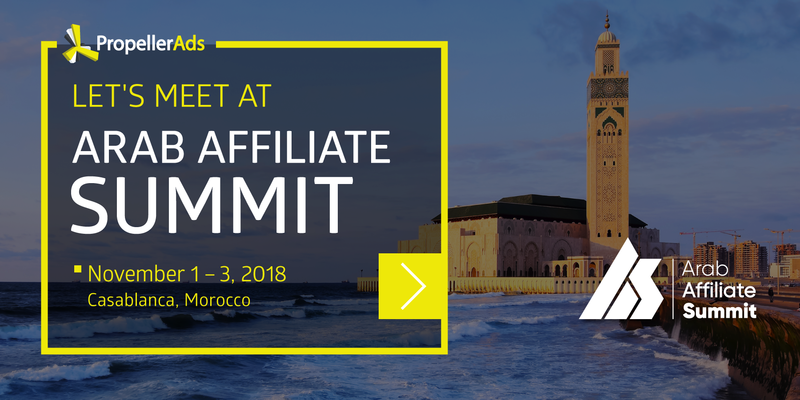 With more than 25 international speakers that will cover topics ranging from affiliate tips to ecommerce insights, the Arab Affiliate Summit offers a great chance to immerse your brand in one of most exciting spheres of digital marketing. At PropellerAds, we strive to provide a reliable, intuitive, and effective advertising platform for affiliates and advertisers alike. We believe that a truly sustainable marketing ecosystem requires a clear and concise relationship between the companies looking to advertise and the publishers that make it happen. Here are some of the topics we’ll cover in the Arab Affiliate Summit of 2018. Our entire mantra revolves around cultivating an awesome relationship between publishers and advertisers while delivering the best experience to consumers. Learn about our affiliate-friendly ad formats that provide better results and a great user experience. If used properly, Push Notifications can boost conversions and profitability for ecommerce affiliates. Our experts discuss how to deploy these effective engagement elements, which are suitable for both desktop and mobile devices. Native ads are becoming more and more popular. Get ready to receive an awesome talk on the greatness of Native ads, plus you can take a sneak peek at our own version which we’ll be rolling out in the very near future! We’ve been in the game for more than 7 years and our team will be happy to answer any questions you may have. We can provide valuable insights and give you a crash course in affiliate success for both publishers and advertisers. You’ll get a chance to meet and greet part of our PropellerAds team and discuss any topics you want, in person. Who is Representing PropellerAds at AAS 2018? This year, we are proud to send a team of representatives for AAS composed of Anton Merkulov, our Head of Business Development and Evgeny Bezrodny, our Business Development Manager. With much pride, we announce that Anton will be attending the event as one of the +25 international speakers. He’ll be sharing industry insights, discuss some of our upcoming releases, and potentially showcase some real-life examples of our successful client stories. Evgeny is a pivotal part of the PropellerAds team as he takes care of establishing and cultivating many of our business relationships. His hands-on experience with some of the world’s leading gambling, games, and ecommerce platforms allow him to provide insights into forging profitable, long-term partnerships with your most important contributors. Our team will be happy to book a meeting in advance, so get in touch with us today and schedule your appointment with our experts in this year’s Arab Affiliate Summit!